So I returned to Boston yesterday afternoon after a pretty action packed weekend at the Frozen Four in D.C. I didn't party as much as I might have, since I traveled up to Baltimore to visit my mother in the hospital on Friday and Saturday, but after seeing my comrades ashen faces at dinner Saturday night... that's probably a good thing. On Thursday, we decided to watch the Miami/Bemidji game from a bar so I don't really have much to say about it... except that Miami continued to scare me with their play, just as they did all tournament(even though Bemidji wrecked Notre Dame I never felt they were as legit as the 12 loss Redhawks for whatever reason). As far as the Vermont game... while Coach Parker and his players might have been "loose" when the Terriers fell behind 4-3 in the third period... I certainly wasn't. The team looked pretty flat and Vermont seemed to be in complete control of the neutral zone... and thoughts turned to "What the hell are we going to do on Saturday night?" Two goals in a 1:13 with 7 minutes to go changed all that... and I managed to write off the nail biter as a result of how well Vermont matches up against BU and how their neutral zone trap and counterattacking style frustrates BU's offense. BU had played Vermont 3 times this year already (losing twice! ), so surely the closeness of the game was an artifact... there wasn't much reason to suspect a #4 seed was going to bring it like Vermont did. Of course, I didn't really count on the fact that Miami could play the exact same game plan (why wouldn't you?) and had an even better defensive team than Vermont. I'll admit it... BU got totally outplayed and outworked for most of the Championship game... and based on that didn't "deserve" to win. If I was a Miami fan, I'd be royally pissed at the outcome. But... what can you say? When they pulled Millan with 3 1/2 minutes left, I don't think any of my friends thought BU had a chance... the older couple next to us (Miami fans) cut out at the stoppage... but based on the crazy way the tournament had played out to that point, I really felt BU still had a chance... if only a slim one. I did, in fact, turn to my buddy, and say half-jokingly "Two goals in 1:19 here we go." Less than twenty seconds later Zach Cohen used some sort of voodoo to sneak it by Reichard(I've watched the replay a couple of times and still can't see how it sneaks through) and BU fans finalyl had something to cheer about... and that slim chance seemed a little more probable. But still... down 1 goal with a minute left is a near impossible hill to climb. It's hard to describe how exciting it was when Hobey Baker winner Matt Gilroy took a hard pass from Chris Higgins, deked a defenseman and then put a perfect pass on the stick of Nick Bonino who put home the tying goal. 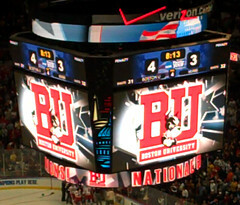 After that, while I just couldn't believe that BU would blow it... I was still pretty nervous... and so Colby Cohen's fluky game winner in OT was both exhilarating and a big relief. It was an awesome experience, and it was great to share it with a bunch of guys with whom I had season tickets back in Walter Brown. I'm not enough of a historian of college hockey to say whether the title of this post is accurate... though that's what Dan Shaughnessy and Jack Packer seem to think... but I know it was the best hockey game I've ever seen (certainly in person)... and I think that's probably all that matters.